Update (Nov. 5): If you kept an eye on the Twitter and Facebook feeds over the weekend, you might've seen some new things that we know our genius UGC designers have been asking for: New and more complicated templates! These designs have been created to look better and give designers a greater challenge when making their own custom looks. It's not just the Heavy Gunner, Berserker and Priest getting the love, though, we have one more UGC weapon template coming! We've got more sneak previews and special tips coming, so check back here or on Twitter and Facebook to get the news as we approach the Chaos Rising Update on Thursday, November 8th! Are you ready for a real challenge? 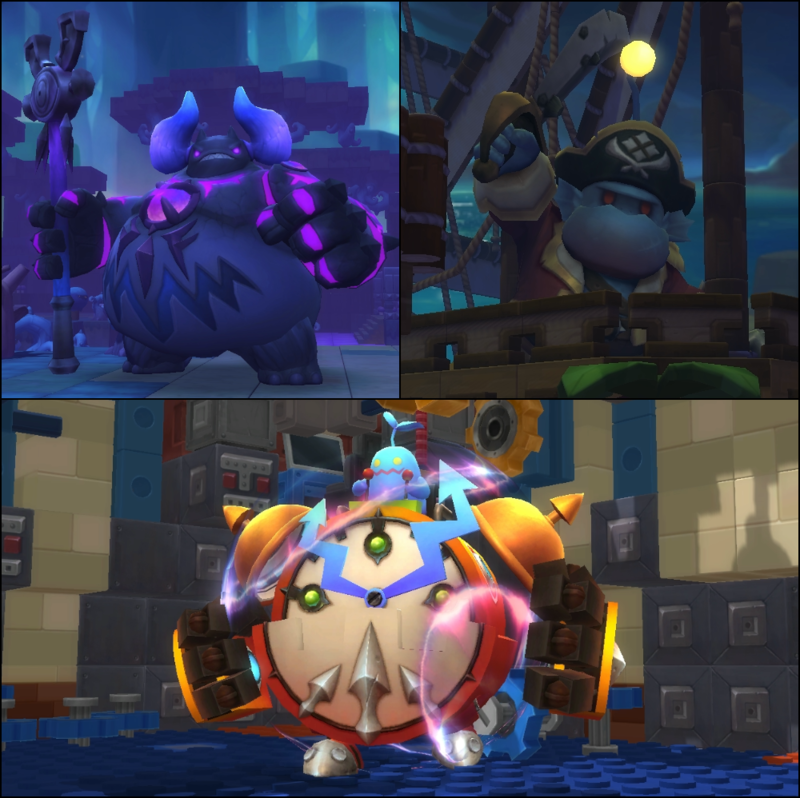 On Thursday, November 8th, Chaos Raids arrive to MapleStory 2! These 10-player dungeons will be the most difficult fights you've seen in MapleStory 2 with the most powerful rewards to match! 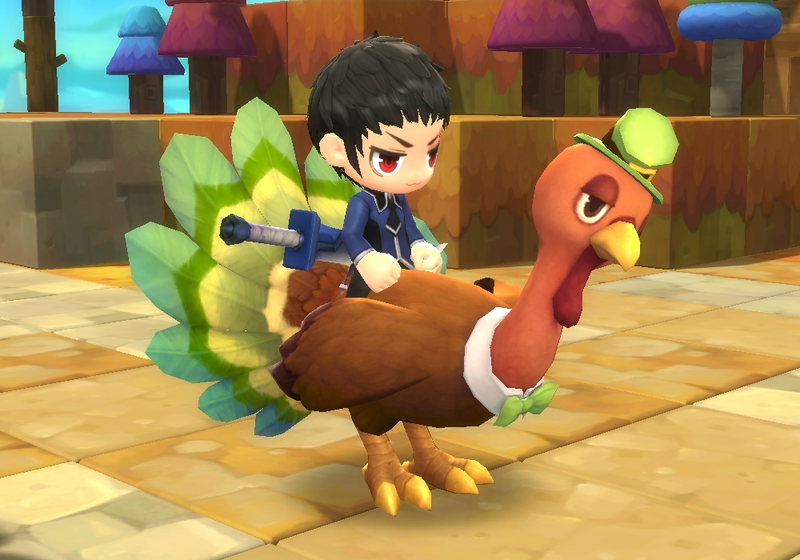 We're also going to be unloading a set of quality of life improvements to make your time in Maple World even better, plus special Thanksgiving events and a new slate of items in the Style Crate! It's time to take on MapleStory 2's bosses in some real fights! Get your best equipment ready, find a talented team to back you up and delve into the Chaos Raid versions of Shadow Altar, Moonlight Fortress and Ludibrium Clock Tower! Chaos Raids are advanced challenges that will require more from you than any of the other challenges that Maple World has presented so far. Skipping over almost the entire dungeon and heading straight to the final boss, you'll only have 15 minutes to take your enemy down. Your foes will have vast amounts of health and their attacks will strike harder than ever, so you'll need powerful weapons, a good team and quick thinking to succeed. We hope you enjoy the Chaos Raids... because the Bosses sure will. Collect each piece of armor in a set to gain additional bonuses on top of the raw power granted, and use it to climb the ranks. If you don't get the piece you were hoping for or want to try for a better set of stats, don't fret! 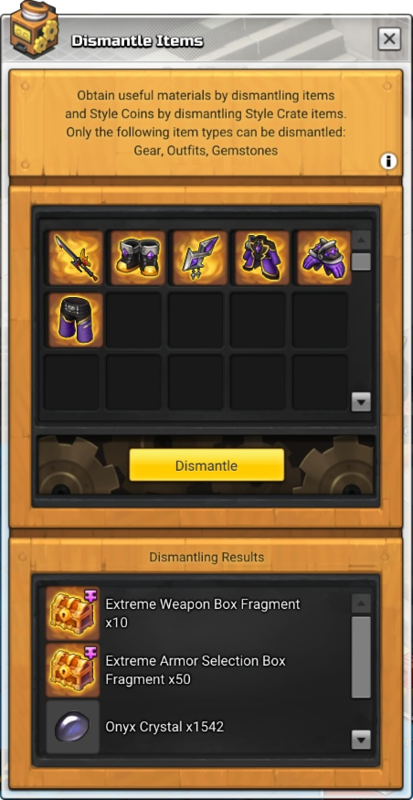 Legendary Gear can be Dismantled and converted into Weapon Box Fragments and Armor Selection Box Fragments for that set. Enough fragments can be combined into a box that contains that set's weapon, or your choice of armor from that set, the resulting item is no different from the one you can get from the Chaos Raid itself. Sometimes, it's the little things that matter most, the tiny problems that get in your way that can frustrate you greater than you'd expect. We've been keeping a close eye on your feedback and the Chaos Rising update will contain a slate of quality of life improvements to make your MapleStory 2 experience even better. We'll be unveiling many of these features over on Twitter and Facebook over the next week. First on the list, revealed yesterday, was Wardrobe Swap, a new feature that allows you to set up multiple sets of Gear and Outfit arrangements, so that you can swap your look in and out with the click of a button. No more needing to dig through your inventory to find just the glasses that go perfectly with that hat, and the best part is, it's entirely free of charge! We're also adding additional Quickslot Bars for your use! You'll be able to load up multiple layouts of skills, or collect your various mounts and party items into an additional slot. These Quickslot Bars will be accessed by clicking on the buttons next to the Quickslot's number, or with keybinds that can be found under Controls > Misc (Quickslot Bar 1, Quickslot Bar 2, Quickslot Bar 3 and Cycle Quickslots). Remember to keep an eye out on Twitter and Facebook for more information on the coming changes! Thanksgiving comes to America in a few weeks, and the favored meal isn't going to be taking it lying down! November will feature a special event to keep your bellies full as we come up on Turkey Day, and you'll be able to claim some special prizes for beating back the fowl menace! November's Style Crate is Coming! The Style Crate gets a refresh, rotating out some of the contents and introducing new outfits, badges and more to the Style Crate, Meret Market and Coin Shop! We'll also be adding new items to the Meret Market, including a special package for the Thanksgiving season and cuddly little pets to keep you company! The Chaos Rising update arrives during the maintenance on Thursday, November 8th! We'll see you then, so make sure you're ready for the fight to come! Breaking news, my friend! Anyone who needs substantial MapleStory M Meso at a reasonable price, we have a treat for you now. MMOAH is providing a great service for buying MS 2 Mesos, along with big discounts as well. Follow the Buy MapleStory 2 Mesos to view more details or purchase now!